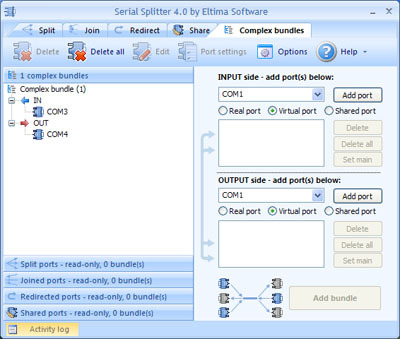 COM Port Splitter is a handy utility for splitting any hardware COM port into a number of virtual COM ports, so that each of them behaves exactly like the original port and even has the same name, and any data arriving at the original port is simultaneously received by all virtual ports. For instance, the COM Port Splitter can let a serial device interact with multiple applications at the same time. Another job COM Port Splitter can do for you, is joining some COM ports into one virtual port, which is quite useful if you need to enable some application to handle multiple serial devices simultaneously. Any data received by one of the joined COM ports is instantly forwarded to the joining virtual port, and vice versa. COM Port Splitter can also redirect all serial traffic from a hardware COM port to another COM port (hardware or virtual), meaning that any data sent to the redirected port is immediately received by the redirection port. You might be using some irreplaceable software whose serial-port settings cannot be modified so easily; that would be a problem before, but now you have COM Port Splitter. Besides, COM Port Splitter might be what you always needed for creating complex bundles of real and virtual serial ports and interconnecting them as you wish, thereby enabling data exchange between those ports.